The confusion around the killing of 3 women working at a Puma factory highlights Cambodian corruption. Cambodia doesn’t always get its man. Many well-connected criminals have often walked away from crimes as serious as murder, which remain unresolved and the perpetrators still at large. So it was in the case of three hapless women who worked for German sports shoe maker Puma and who had joined a thousand others on a protest demanding better working conditions in their Special Economic Zone (SEZ) in Bavet City. A gunman dressed as a bodyguard opened fire and shot the three. They were rushed to hospital and survived, although one is still listed as critical. The gunman, despite a heavy police presence, escaped. And thus began a song and dance routine known all too well in the country. At first, the authorities said they knew who the alleged culprit was. This was followed by some back tracking and claims that the authorities actually didn’t know, even though Cambodia’s media scrum had already discovered the alleged assailant was holding out at a country estate owned by a close relative of the prime minister. Then the Cambodia Daily published a photo on its front page with the alleged assailant, surrounded by police, waving his gun in the air, apparently just after the shooting. But the police in the photo seem to be acting more like scouts. The photo originally appeared in Koh Santepheap newspaper and later on the web. “The gunman first left his car and walked into the SEZ toward a crowd of protestors. I first heard the shots, several, I turned my eyes to the crowded workers,” the photographer told the Daily. 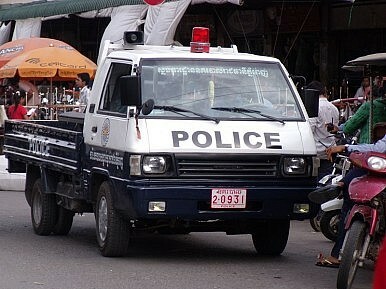 Cambodia has a well-earned reputation for impunity, particularly among the country’s ruling elite. But given the circumstances, this latest violent episode was prove a little tricky to hush-up, even after senior figures popped into the hospital and offered the wounded the grand sum of about $500 each in reparations and a promise to keep quiet. However, those pests in the media found out about that one too, and splashed it all over their pages. Then, to everyone’s surprise, the authorities gave-up and rediscovered their lost gumption, naming the Gov. of Bavet, Chhuk Bundith, as chief suspect in the triple shooting. Unfortunately, it didn’t end there. The police, specifically a district officer named Chum Rei, came out and said no arrest had been made. According to Open Development, Provincial prosecutor Hing Bunchea has said Bundith will be questioned on March 16. Word has it he might now be found at the home of a prominent deputy prime minister. Such are the vagaries of Cambodian politics there are about 10 of them.